As GM has written multiple times in the past, WMATA’s long term planners have contemplated bringing the Metro to Georgetown in the distant future. While the future is still distant, the planners nonetheless took an important step recently and endorsed a Metrorail expansion that would create two stations in Georgetown. The exact details remain somewhat fuzzy, but as you can see above from the map accompanying the announcement, the planners call for a new tunnel under the Potomac and a new subway line heading underneath M St. and onward to Union Station. This part of the plan is very similar to most ideas the planners have floated in the past. But what the train would do after Union Station is dramatically different in this plan than in the earlier ones. 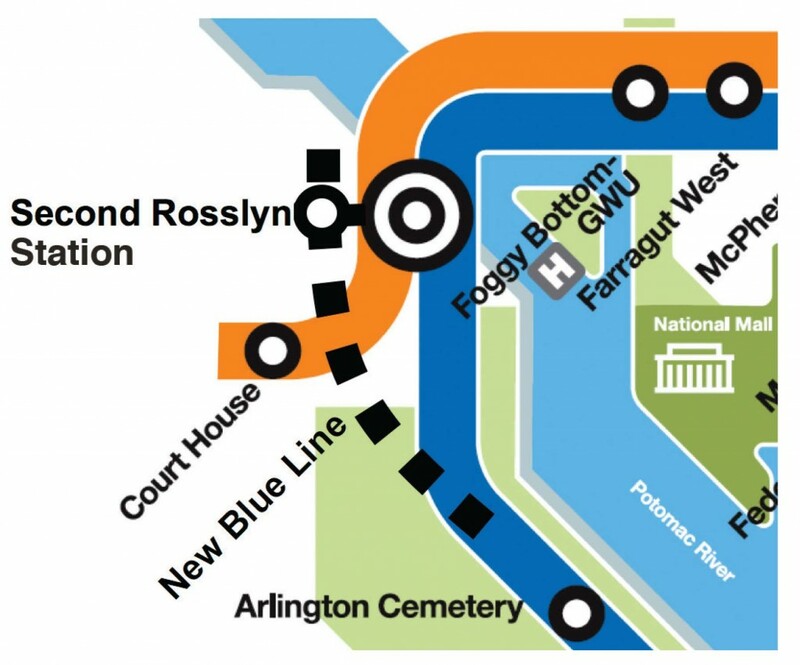 Earlier this week, GM went over all that you need to know about a Georgetown Metro station. That same day, GGW pointed GM to a little bit more information on the possibility of finally bringing Metro to Georgetown. GM originally wrote that other than a couple statements about the need to build a new split Blue Line through the central core–which would include a new station in Georgetown–little progress towards planning has been accomplished. That wasn’t quite right. WMATA has convened a group of regional transportation and land use experts to form the Technical Advisory Group (TAG). TAG has been meeting for a little over a year to plan for the long term future of Metro. Already the group has issued several reports of the problems Metro faces in the future and the possible solutions. Most interesting, for Georgetown, was the presentation published last October. This presentation discussed, among other solutions, the split Blue Line (as well as a split Yellow Line). What Metro plans to do over the next ten years will significantly impact if and when Metro finally comes to Georgetown. GM recently became aware of a report by Metro’s long term planning project: Momentum. The report is chock full of interesting stuff regarding the future of Metro, but today GM wants to focus on what Metro’s plans are for our neighbors to the south. What will Georgetown look like in 2028? More importantly, what do you want it to look like? Wider sidewalks? Easier parking? More restaurants? Better transit? You may soon have the opportunity to answer those questions, and actually have an impact. Yesterday the Georgetown BID announced an ambitious new effort dubbed “Georgetown 2028”. The project is designed to take a deep look at what the neighborhood needs to do over the next fifteen years to face the challenges of a city growing and changing at an incredibly fast pace. Future Georgetown must compete against new and “coming soon” commercial areas in the District and nearby areas so it remains home to fine dining, distinct retail opportunities, great hotels, and major businesses. Future Georgetown must have the transportation strategies and system to efficiently move people in, out and around. Future Georgetown, as a riverfront neighborhood, must have the forethought to protect itself from the impacts of a changing climate, including rising water levels. It must understand its future infrastructure needs and decide how it wants its public infrastructure to be designed, used, and managed. And finally, future Georgetown will need to manage all these issues as efficiently and effectively as possible. The effort is a breathtakingly broad look at all the changes that need to be made to the physical and business environment in Georgetown. The project is organized around a task force of business, educational, governmental, and residential representatives (full disclosure: GM is on the task force representing the Citizens Association of Georgetown). Supporting the task force are three working groups addressing, respectively, transportation challenges, economic development, and the public space. Those topics give you a good sense for what sort of broad-based topics the project will consider. And the project is also very wide-open in terms of solutions. And consistent with that, the project is seeking input from the public. There will be a community engagement meeting on June 13th at 1055 Thomas Jefferson St. at 5:30 to 8:00. There will be a second community engagement meeting in September. But the input isn’t limited to community meetings. The project has already set up a community engagement website, which allows you to log in and offers your thoughts on what you want to see change about Georgetown over the next 15 years. There’s even a rewards program! Build up 150 points by logging in, referring a friend, and contributing enough ideas and you win a lunch with the BID CEO Joe Sternlieb, during which you can share your thoughts on Georgetown and what ideas you have to make it better. Basically this is exactly the sort of comprehensive and ambitious planning effort that GM has been calling for for years. GM is absolutely thrilled that it is finally happening, and he’s honored to be taking part. Circulator to the Mall, How About U St? 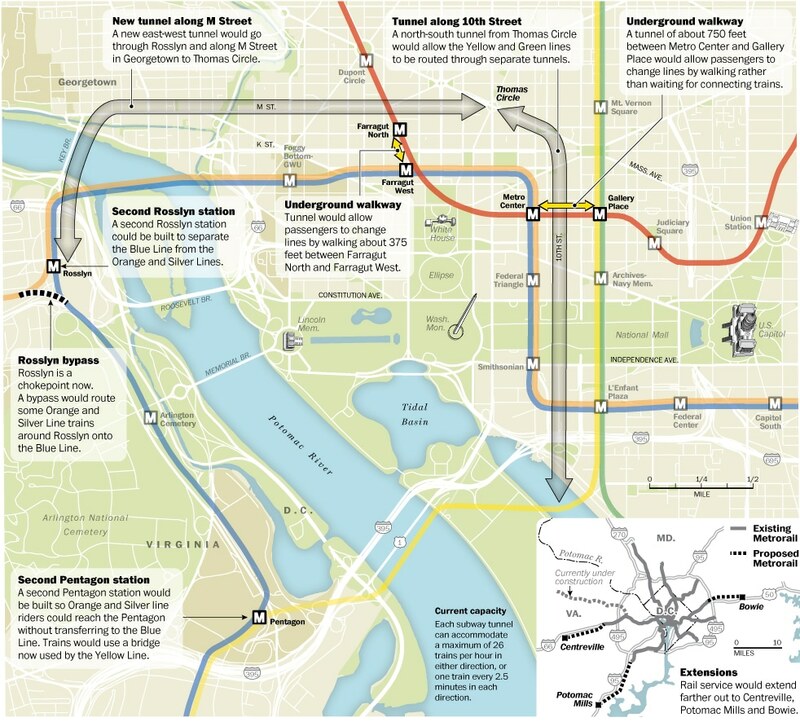 Back in 2010, DDOT floated the idea of creating a new Circulator route that would travel the National Mall between Union Station and Georgetown. 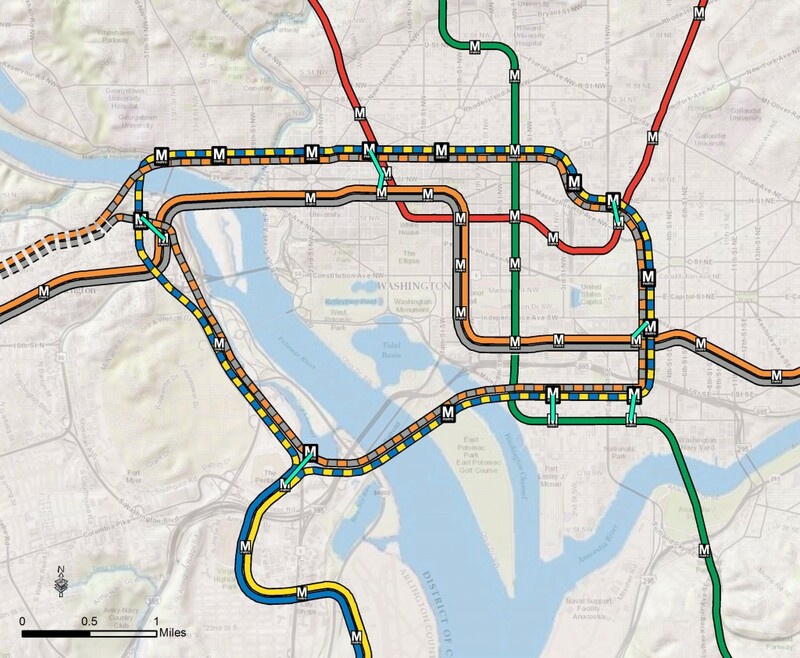 It also suggested that the Rosslyn-Georgetown-Dupont route be extended to U St. Now the former is looking likely to happen soon, and the latter is getting some strong support. From 2006 to 2011, there was a seasonal Circulator route that went around the Mall. It suffered from turf-battles with NPS and was never terribly successful. Way out in the other Washington (Seattle, Washington) some folks are pushing for a novel approach to urban transit: gondolas. 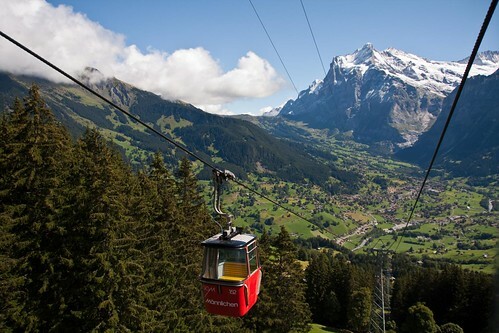 Two separate proposals for sky gondolas have been floated for the Pacific northwest city recently. One is a pipe dream, but the other at least stands a faint chance of seeing the light of day. GM mentions this because he recently heard a not entirely unserious argument to bring such a system to Georgetown. It’s a crazy idea, but maybe not as crazy at is seems at first. The idea would be to better connect Rosslyn with Georgetown University. Stringing a system between those to points could potentially move a great deal of individuals. Georgetown estimates that its GU-Rosslyn GUTS bus route carries over 700,000 riders a year. Image courtesy of the Washington Post. As reported in the Washington Post, WMATA leadership is recommiting to the concept of constructing a new Potomac river crossing between Rosslyn and Georgetown. This is a topic GM has discussed previously. In short, the construction of the Silver line out to Dulles and beyond will eventually put too much pressure on the tunnel between Rosslyn and Foggy Bottom. As ridership increases, Metro will have to come up with a new way to get Virginia riders across the Potomac. Short term solutions involve sending more Blue line trains over the 14th St. bridge, but ultimately a more radical solution will be necessary.